Microsoft’s Windows update schedule has been much more frequent over the past few years, with the software giant looking to maintain a solid experience for users while the plans for significant feature implementations are made. Today, as a part of a move to bring monthly house-keeping improvements, the ‘August Update’ for Windows 8.1 has been rolled out. Naturally, the tweaks are relatively minor, and below, we’ll run through everything that Microsoft has bundled into this release. Although the BUILD developers’ conference focused a lot of its attention on Windows Phone 8.1, we still learned quite a bit regarding the software maker’s future movements with Windows. Notably, we now know that the traditional Start Menu will be making a dramatic comeback at some point next year, with Windows 9 having also been slated for a 2015 roll out. In the meantime, though, Microsoft is channeling its efforts into improving Windows 8.1, and specifically, making it more friendly for those running a more traditional PC rig. From 2012’s Windows 8, it was clear that the Office maker was taking a leap into the era of the touch-screen, but while there was nothing wrong with this move as such, it did seem to overlook the fact that most of us still use notebooks and desktops. As such, the August Update to Windows 8.1 offers “precision touchpad improvements,” which takes the form of three new settings promoting better functionality for those with touchpad-enabled devices. As well as a few new developer tools, login prompts for SharePoint Online will be less frequent, and by ticking the “Keep me signed in” check box, you’ll remain logged in without any further notification. Obviously, this isn’t much to write home about, and for most users, there won’t be a discernible difference. However, it’s certainly good that Microsoft is pushing out these regular updates, and hopefully there’ll be much more to report in September. 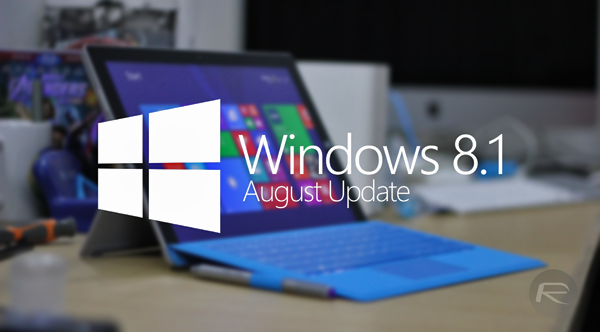 You can download the Windows 8.1 August Update via the direct links we have provided below. We’ve covered all bases with the 32 and 64-bit editions, so irrespective of your computer’s architecture, you should be up and running with the updated version in no time. Despite what the change log says, it’s probable that Microsoft had added a couple of other, minor tweaks, and if you do notice anything, be sure to let us know in the comments. link is broken, please update the link.. I just got a product key from ** windows 8.1 key sale^^ by bing,it worked fine , I’m so excited to share my experience here.